Heavy-duty industrial tools and machinery need consistent lubrication in order to properly perform their day-to-day functions. In the absence of regular lubrication, the core components of the equipment would begin to rust, overheat, and rub up against one another causing considerable damage. In addition to hampering production schedules, these problems can facilitate the need for costly repairs and replacements. Companies interested in keeping their machinery up and running for the foreseeable future would do well to invest in MagLube brand lubricants as well as our convenient MQL system. At MagLube, we’re fully aware that lube application is not a one-size-fits-all affair. 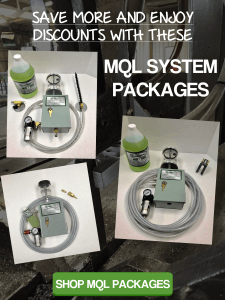 This is why the MQL system offers clients an extensive range of nozzle options. We’re proud to offer a sizable selection which includes circular saw nozzles, band saw nozzles, magnet nozzles, and port halo nozzles. Furthermore, if you’re unable to find a nozzle that suits your specific needs, don’t fret – we also offer custom-designed nozzles for a variety of different applications. Our MQL system strives to meet the needs of a rapidly-expanding roster of clients. As such, we understand the need for diversity in our applicators. Even though our mass-produced application systems satisfy the bulk of our client base, we realize that certain clients – and certain tools – have highly specialized needs. For this reason, MagLube is happy to create custom-made application systems for clients with specialized machinery. This is just one of the many perks of manufacturing our applicators in-house. When purchasing a MQL system from MagLube, you have quite a few options from which to choose. For starters, our activation options range from air-only to remote magnet, while our reservoirs are available in a convenient range of sizes and materials. Lubrications can play an invaluable role in keeping industrial tools in working condition. However, not all lubricants are equally beneficial. If a dependable, nontoxic lube and a user-friendly MQL system are what you seek, look no further than MagLube.